As at Jerusalem, so also in the primitive Roman Church we find immediately that when Christians became more numerous, seven deacons assisted the Pope in assemblies of the faithful and in the administration and exercise of charity. The Liber Pontificalis (Pontifical Book) attributes to Clement I (A.D. 92-99) the division of Rome into seven regions for the care of the poor of the City, and thus for this service do we find the deacons set apart. As a matter of fact, Clement's successor, Pope Evaristus (A.D. 99-108), clarified the functions of deacons in the Church and ordained seven deacons to assist the Bishop of Rome in the distribution of alms. In the third century, Pope Fabian (A.D. 236-250) better organized the work of the seven deacons, creating fourteen regions in Rome and entrusting two regions to each deacon. With the growing number of Christians, other priests and deacons were assigned as auxiliaries to the principal titulars of the churches and diaconates (deaneries). In reality, for the service of the Church of Rome, the deacons were not sufficient and thus Pope Cletus (A.D. 80-92) also established twenty-five as the fixed number of priests, for the service of the City, with a territory entrusted to each. Thus, parishes began to develop. During the pontificate of Gregory I (A.D. 590-604), the number of regions in Rome doubled and so the number of deacons in Rome became fourteen. During the pontificate of Gregory II (A.D. 715-731), four new deacons were added. These new deacons were called "palatine" deacons1 because they were chosen to serve at the Lateran Basilica. Thus, the number of deacons grew to eighteen. The role of these deacons consisted in helping the Pope during the weekday Masses to which they were assigned according to their turn. In the second half of the eleventh century, with the re-organization of the College of Cardinals, the churches of the diaconates began to be assigned by title to eighteen cardinals. Therefore, these cardinals became known as “cardinal deacons,” remaining as such in conjunction with the titles of their respective churches. One can say that these principal priests and deacons had to help the Pope in the Roman basilicas where they were incardinated and thus they began to be known as “cardinals.” From this moment forward, they came to be called “cardinal priests and deacons,” this is to say, “incardinated.” At this point, we discover that the Roman presbyterate – counselors and cooperators of the Pope, the Bishop of Rome – from 1150 began to constitute the College of Cardinals together with their dean (who was the Bishop of Ostia), as well as the camerlengo who acted as the administrator of papal goods. Thus we see that from the earliest times cardinal deacons were employed for the administration of the Church of Rome and for the liturgical service of the Pope. And thus it would remain for centuries to come. Only in the eleventh century, with the ecclesiastical reform of Pope Leo X, did the cardinals become less tied to the liturgical and pastoral service of the Diocese of Rome, so that they became the direct helpers of the Pope in service to the universal Church. On the other hand, and in direct relationship to the cardinal deacons, we find the dalmatic. From the beginning of the third century, this vestment had become the outerwear of the most distinguished people of Rome. We find mention of the dalmatic in the Liber Pontificalis as a distinctive, honorary garment granted to the Roman deacons by Pope Sylvester (A.D. 314-335), “so that deacons would use dalmatics in church” (Liber Pontificalis, Ed. Mommsen 1,1, p. 50) to distinguish them among the clergy due to the fact that they had a special relationship with the Pope. Before that, the dalmatic was part of the papal wardrobe and the proper and distinctive garb of the bishop. Outside Rome, deacons wore a simple white tunic for liturgical services, over which was soon added the orarium or stole. The news of the concession of the dalmatic to the deacons by Pope Sylvester is confirmed by the Roman author of the Quaestionum Veteris et Novi Testamenti (circa A.D. 370), who, not without a touch of irony, writes: “Today the deacons vest like bishops” (n. 46). This goes to prove that the Roman Church retained the use of the dalmatic as its own privilege, and that only the Pope was able to confer it. The fact that this Roman custom was still in place in the tenth century is affirmed in the Ordines Romani (Roman Ordinals) XXXV (n. 26), which rubric maintains that the prerogative of the dalmatic was for the cardinal deacons, that is, for the seven regional deacons of the Diocese of Rome, who received the dalmatic upon ordination, while the deacons outside the Diocese of Rome were not permitted to use it. 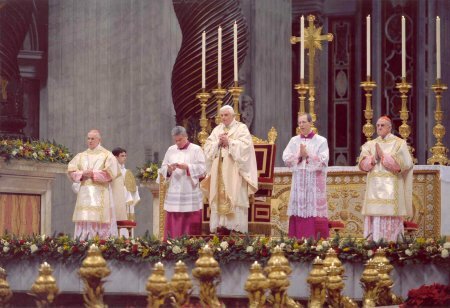 From what we have briefly outlined, one can surmise that when cardinal deacons wore the dalmatic to serve the Supreme Pontiff in liturgical celebrations, we are dealing with a typically Roman liturgical usage in strict relation to the history of the Popes and the papal liturgy. The cardinal deacons use the dalmatic when they serve the Pope, whether at Mass or in other liturgical celebrations, but not when they concelebrate with him. In this second instance, they wear the vestment proper to each priest who functions as the principal celebrant, which is the Gothic or Roman chasuble. Wearing the dalmatic when serving the Pope serves in reality to manifest externally their function as “ministers” of the Pope. One should not forget that, as history has shown us, the true significance of the dalmatic does not necessarily suppose that only deacons can use it. On the other hand, bishops wear the dalmatic on the most solemn occasions, underneath the chasuble, and also as the outer vestment when anointing the altar or during the washing of the feet. In this latter instance, as the Caeremoniale Episcoporum (Ceremonial of Bishops), n. 301, relates, the bishop takes off the mitre and chasuble but not the dalmatic. The dalmatic underscores not so much the fullness of the priesthood but service as a characteristic of episcopal ministry. In the case of cardinal deacons wearing the dalmatic, this goes to underscore their role as servants and also as close collaborators of the Roman Pontiff in the liturgy. The dalmatic is a sign of service, dedication to the Gospel and to others. 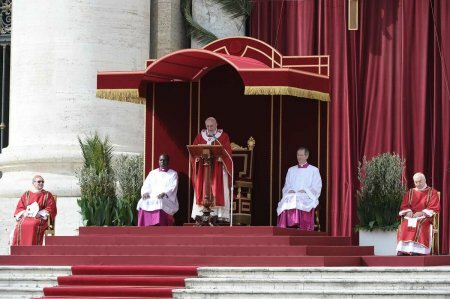 But also when the bishop uses the dalmatic, he uses it to serve: whether during the washing of the feet, or in the special liturgical service that bishops, who are cardinal deacons, carry out near to the Roman Pontiff. (1)Palatini since they served the papal palatium (palace). (2)Italian uses two different words for the outer garment of priests and bishops at Mass: pianeta and casula. English has only “chasuble,” which is then distinguished by adjectives like “Roman” or “fiddle-back” (in colloquial use) for the pianeta and “Gothic” for the casula.